In 2002, a remarkable number of Iranian films focused on the lives of girls and women. This stress on the distaff side across genres signalled a diverting switch from years past when the mere depiction of women characters was subject to stringent regulation. Now, with fewer censorship hoops to jump through, Iranian filmmakers find themselves more able to address issues pertinent to their female viewers. Several films, however, stretch this freedom to its limits. Foremost among them is Women’s Prison (2002), the much-anticipated feature debut of veteran producer, Manijeh Hekmat. Teenage Pegah, whose previous film was The Girl In The Sneakers (1999, produced by Manijeh Hekmat), typifies a new generation of young Iranian actresses. Like her peer Baran Kosari (the daughter of director Rakhshan Bani-Etemad), Pegah trained in master classes taught by seminal actress Golab Adineh (star of Under The Skin Of The City, Bani-Etemad, 2001). Proud mother Manijeh says that she and Pegah “had a friendly and professional relationship on the set.” Pegah also accompanied Hekmat during the research phase of the film. soon after the Revolution, the red light district in Tehran was totally demolished. Most of the prostitutes were living at that place and many of them were imprisoned, and some executed. The Revolution should have saved these women, but the authorities executed them. Since the executions were held very early in the mornings, we found that prisoners kept vigil through the night, staying awake with the woman who was to be executed. Although Hekmat has been in the film business for 20 years (as producer, first assistant director and production manager), she faced many problems in making Women’s Prison. “As a first-time director, I had to get a particular permit from the Iranian Society of Film Directors and they denied granting such a permit, although I was qualified for the Society’s conditions.” Eventually, she obtained the permit in the name of her husband Jamshid Ahangarani (the film’s art director). Financing, too, was a big barrier. “On the one hand, nobody dared to finance my project, and on the other hand, I never agreed to reduce the quality of my movie for financial reasons.” Ultimately, she financed it herself, with producer Sirius Taslimi joining her mid-shoot. Hekmat’s long-time experience in production and ability to finesse bureaucracy proved an invaluable asset. We could not build a jail as a set because of our tight economic situation. Therefore, we had to convince the authorities to let us work at real jails. We referred to the Judiciary authorities and they immediately rejected our proposal. I was not disappointed at all and I had 42 different meetings with authorities in three months and eventually I got the jail. The prison setting she used is part of a very well-known and still active Tehran prison built at the time of Reza Shah. The shoot took 75 days. “Everyday, at 6 a.m., when I was turning from the main street toward another street where the prison is located, I was quite concerned to see my crew behind the closed ports of the prison and I had this nightmare of being deprived of the location all the time”. Ironically, Hekmat almost found herself on the wrong side of the prison bars in February. When her controversial film was excluded from Tehran’s 2002 Fajr Film Festival, many foreign guests clamoured to see it. She was threatened with arrest if she dared to arrange a private screening. Ultimately, tapes of the film made their way to selectors from various international film festivals and the director’s cut of Women’s Prison made its world premiere in competition at the Venice Film Festival in September 2002. 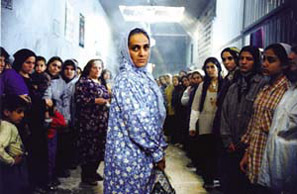 With pressure from reformists in the Iranian government and support from many members of the Majlis and President Khatami himself, a censored version of Women’s Prison finally opened in Tehran on August 7, 2002. In spite of not being allowed to have television teasers, the film set new box office records for an opening in the post-Revolutionary era. Alissa Simon is a freelance writer on film and has contributed to The Village Voice, Sight & Sound, and CinemaScope.